This solution, which has unveiled Vogel completo Iberian, allows you to transmit streaming wirelessly among multiple users. It combines a software and a hardware based on the Android platform. Within the family of Oneav products, Vogel's Iberian He has released one of their new meeting and collaboration, Solstice Pod of Mersive. 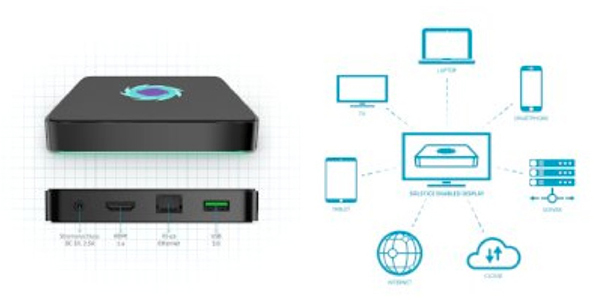 It is a turnkey solution that combines software to wirelessly transmit content simultaneously among several users with high-performance hardware. Like Solstice Software, Solstice Pod offers a path of continuous updating for new features and functionality. The Pod also includes a wireless access point that supports deployments inside and outside the network. This collaboration solution is based on a hardware Android platform specially designed for the transmission of wireless streaming. The small Pod connects to the screen, allowing multiple users to instantly connect, share content and be able to control your display device. This facilitates presentations, collaboration and decision-making. Solstice Pod is designed for use in classrooms, conference rooms, or any space collaboration. A solution that can be implemented into existing networks or enable implementations 'drop-in' built-in wireless access point to be used outside the network. Compatibillidad mirroring for iOS, including iOS 9. Remote configuration via web browser. It includes all the features of security, moderation and Solstice software configuration. It enables mounting behind the screens, projectors or under tables. Modes of dual network support company and invited users.